Kaleidoscope Imagery recently captured Mike & Tierney’s Galloway wedding at The Carriage House, and it was such a blast! I had the pleasure of shooting their Ocean City engagement session last year, so I already knew how fun they are to work with. They are open to all of my crazy ideas, and their genuine love and admiration for each other highlights every photo they take together! The Carriage House was a beautiful setting for so many images, including sunset portraits with a luxurious Rolls Royce and night shots with the whole building lit up in the back ground. The day began at Tierney’s mother’s home in Buena, NJ. 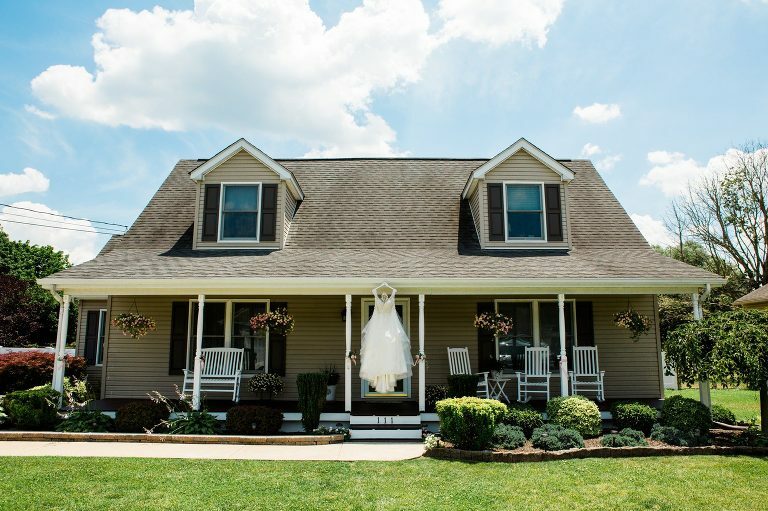 I love the adorable dress shot we were able to capture which showcases the whole home on a gorgeous summer day. 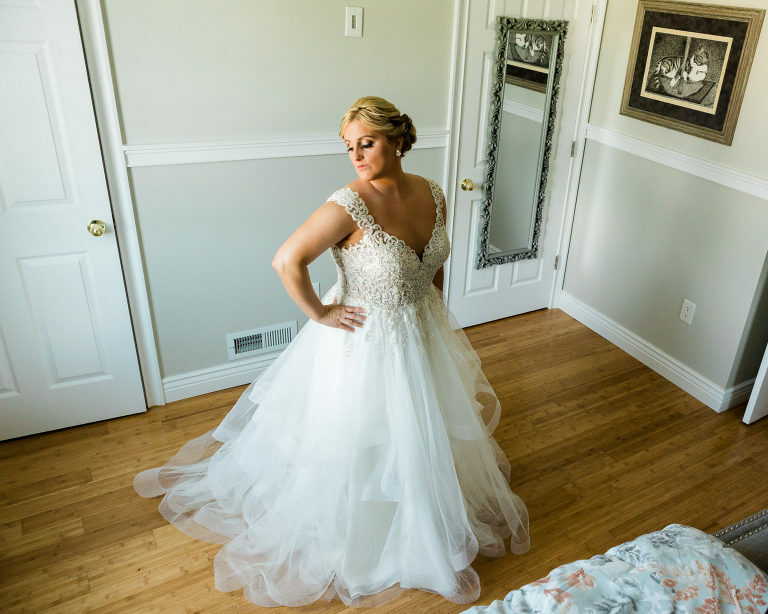 Seeing Tierney’s emotional reaction to a video Mike made for her was so special, as well as capturing the reactions of the bridesmaids as they saw Tierney for the first time in her stunning ivory wedding gown. After these sweet moments, it was time to go to the ceremony which took place at Our Lady of Pompeii Church in Vineland, NJ. After the couple officially tied the knot, we made our way to The Carriage House. First, we had a quick portrait session. After that, the newly weds enjoyed their cocktail hour and prepared for the big party. The reception space at this venue is just gorgeous! From the center pieces to the romantic candlelit atmosphere to the loft stage overlooking the dance floor, there was so much to love about the ambience! The real icing on the cake for the Kaleidoscope team was the golden hour portrait session with the Rolls Royce. The car, her sparkling dress, the two of them together, the sun bursting in the background… The images are to die for. They are the kind of portraits Kaleidoscope Imagery could create every day and never get old. I also love how we wrapped the day up with a night shot which celebrates the couple at the venue they chose. The Carriage House glows in the background while the couple are illuminated in the front. Kaleidoscope Imagery Loves Shore Weddings! The Carriage House is just one of the many South Jersey shore area venues that Kaleidoscope Imagery shoots at frequently. Are you getting married down the shore? Be sure to ask us about your venue! There’s a good chance we’ve worked there before and already have some amazing shot ideas to share with you. Tierney and Mike: Congratulations and Thank you for inviting me to capture your Galloway wedding at The Carriage House! I can’t wait to get the rest of your gallery into your hands. You guys rock!